On behalf of your graduate student union, welcome back to campus (and hopefully to warmer weather ahead!). We are thrilled to have opened this semester with news of a 8.99% pay increase for Teaching Assistants next year. Your colleagues worked hard to advocate for fair pay over the last two years; union members met regularly with senior finance administrators, shared stories about our financial hardship, held demonstrations, and worked with the Faculty Senate and the Associated Students of Madison to pass resolutions in support of mandatory fee remission. Hundreds of graduate students participated in this process, and our collective effort made this possible. This raise wasn’t granted; it was won. 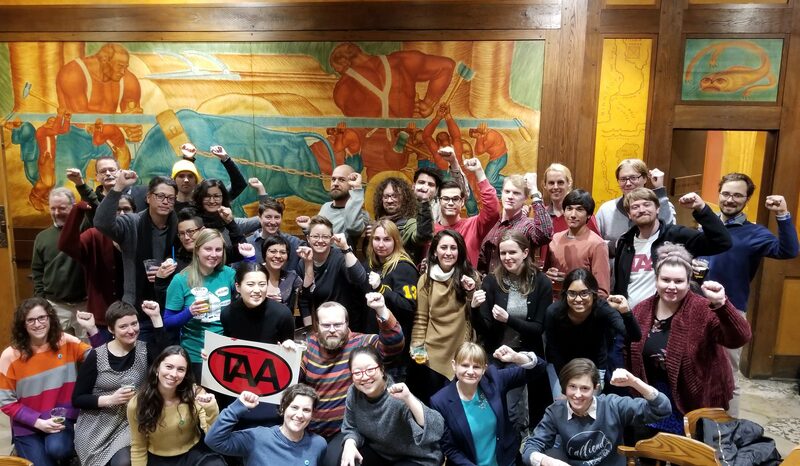 This semester Wisconsin graduate workers are fighting for relief from onerous mandatory fees which make up nearly 10% of our income, a comprehensive grievance procedure to protect workplace rights, and rectified compensation and classification for graduate lecturers. We’re all still overworked and underpaid. $20,000 simply isn’t enough to live on, and it certainly isn’t fair compensation for our knowledge and skills—but we can’t win increased pay and better working conditions without input from all graduate students. If fighting for these issues would better your graduate career, join us and get involved. Contact your departmental union steward or your union’s Executive Board at taa@taa-madison.org. Improving our working conditions improves the quality of our lives, our teaching, and our research. Let’s celebrate this pay increase—and other incremental victories—and stick together for the road ahead towards living wages, a healthy work-life balance, and a more equitable, inclusive UW. Join us Wednesday, February 13, 3:00-4:00pm in the rotunda of Bascom Hall. We will be sharing hot chocolate as we discuss our next steps toward relief from mandatory fees for grad workers and the end of international student fees. April 9 General Membership E-mail: Sit-In Recap! General Membership Meeting Wednesday! And a happy hour on Friday!